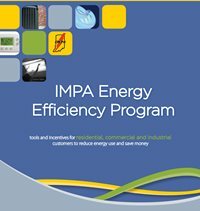 The IMPA Energy Efficiency Program is offered through your local, municipally-owned utility, in partnership with its power supplier, the Indiana Municipal Power Agency (IMPA). These programs can be changed at any time without notice, and are available on a first-come, first-served basis. Some projects must be pre-approved to qualify for an incentive. Equipment ordered, purchased, or installed prior to approval may not qualify. Please refer to the individual program terms and conditions for more information. Visit www.impa.com/energyefficiency to view a list of current rebates or to download an application. ​Turn down your water heater to the warm setting. Be aware of electronics (TV's video players, game consoles, laptops, phone chargers, etc) in your home. These devices draw power whenever plugged in, even if they are truned off. Unplug these devices when they are not in use to save on power consumption. Put an insulating blanket on your water heater. It will pay for itself in about one year. Start using energy-saving settings on refrigerators, dishwashers, washing machines, and clothes dryers. Replace incandescent lights with compact fluorescents. CFLs use a quarter of the electricity used by incandescents and last ten times longer. Focus on replacing 60-100W bulbs used several hours a day. CFLs come in sizes and styles to fit most standard fixtures. Use task lighting and turn off overhead lights. Clean or replace furnace, air-conditioner and heat-pump filters. Make sure the fireplace damper is closed and in good condition. Install a water-heater blanket, low-flow showerheads and faucet aerators. Use weather stripping and door sweeps. Install outlet seals. These inserts fit under outlet and light switch plates, a common source of air leaks. Crawl into your attic or crawlspace and check the insulation. If you have adequate insulation, adding more may not be cost effective. Insulate hot water pipes and ducts wherever they run through unheated areas. Seal up air leaks in your house. The worst problems are usually not windows and doors, but penetrations around pipes, gaps around chimneys and recessed lights, and unfinished spaces behind cupboards and closets. Have your heating and cooling systems tuned up once a year. Duct sealing can also improve the performance of warm-air furnaces and central air conditioners. Seal ducts by brushing high-quality mastic around seams. Ironically, duct tape does not work well for this purpose. Upgrade windows with energy-efficient models or boost their efficiency with weatherstripping and storm windows. Install insulated window drapes or blinds. Fabric stores often have materials and instructions for making your own insulated window coverings. Consider replacing older major appliances, especially the refrigerator. New, energy-efficient refrigerators require about half as much energy as models manufactured before 1993. If your furnace is older than 10 to 15 years, or your boiler is older than 20 years, a newer model will be more energy efficient. Complete an energy audit on your home and get quick estimates of your current energy-use costs. See how much you can save just by making a few changes on the calculator and in your home. See how it all adds up. Get down-to-the-penny energy operating costs for more than 50 different home appliances and electronic devices. See exactly how much money you can save by switching from standard bulbs to newer forms of lighting. Learn more about the energy costs of plasma and LCD big screen TVs compared to traditional TVs.